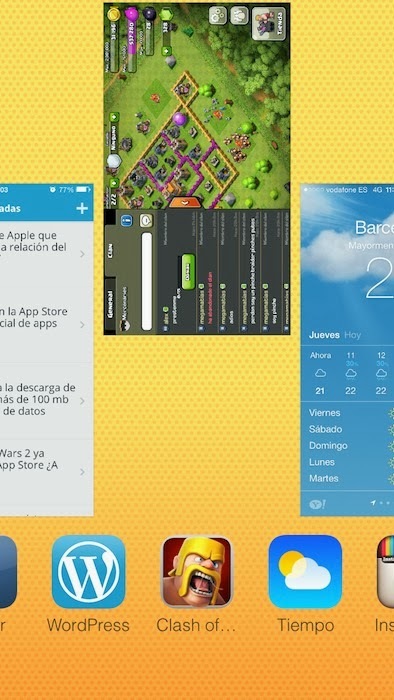 How To Close Apps on iOS7? To access the multitasking on iOS7, double-tap the Home button. From there we will see in a screen capture all open apps. To close a just have to "throw" or "slide" up. Can you customize the switches or shortcuts to apps? Unfortunately not. The there are those that can be used. From Settings / Control Center screens can set that we want to appear, and can activate the locked screen or from the applications. How to Use Notification Center on iOS7? Today, where we see everything about obviously today, as time, alarm or calendar appointments, and a brief summary of what we will have tomorrow. All, where all notifications will not discarded either update apps, messages, emails, etc..
Not seen, where we see yet unseen notifications. To move between the different tabs can slide your finger across the screen from right to left or vice versa. With the arrival of iOS 7 will not only have changed their icons, but they have added new features, improvements and changes in the way multi-task, so it's possible that you meet many "lost " when to do things that before you had no problems. So for your ease the transition from iOS 6 to iOS 7 and since we are already several months using the new version of the mobile and tablet oeprativo Apple, we have created this guide to using iOS 7 where we try to explain how to use the correctly and show you some tricks. What devices are compatible with iOS 7? iPhone 4, iPhone 4S, iPhone 5, iPhone 5C, iPhone 5S, iPad 2, iPad 3, iPad 4, iPad mini and iPod Touch 5G. How I can install 7 on my iOS device? There are two options available, but before any of them recommend making backup from iCloud or iTunes. This menera avoid " scares " unnecessary with any problems you may have during the process. Above all, be sure to make copies of the photos, as sometimes in iCloud not fit all and deactivated. Directly from the device, accessing Settings / General / Update Software. WiFi connection required and recommended to have it plugged in to a power source, thus avoiding possible scares. Since the latest version of iTunes, connecting the device and updating or restoring. What's new on iOS 7? Starting with its new graphical look, we find new icons, animations and sounds all very minimalist. Following the new features included the new multitasking, Control Center, a redesigned notification center, new options for the camera, improved App Store and Safari, as well as redesign of nearly all applications by default. Here you can see the improvements in more detail. How do I delete an entire conversation? Sliding your finger from right to left on the conversation in question. How do I delete part of a conversation? We entered the conversation, hold down the " sandwich " to be erased and press the button " More...". Now we can select the " bocadilos " you want and press the Trash button to delete them. I can see the hours? Receiving or sending each message? Yes, simply slide your finger from right to left on the screen appear the conversation and time. I can? Block any unwanted phone number? Yes, we can block numbers by going to " Contact ", then the " i" and clicking on " Block this contact ". To view and / or unlock these numbers can access Settings / Messages / Contacts Blocked. To access the contact information you can click on the "Contact" button in the top right. From there we will use the " i " to enter your information and your phone to make a quick call. To exit the conversation quickly simply slide your finger from left to right from the edge of the screen. What is displayed in different tabs new? Now the Photos application is divided into three different sections : Photos, Shared and albums. In Photos can browse through different times. Starting from the view for years, will enter the Collections view, which will separate photos by location. From there, we enter each computer collections to see it all at times. In sharing we can see all the photos shared by iCloud and give "Like" or leave comments. In albums have classic view of life, with separate photos into folders : Reel, Streaming, View and Videos, plus your own folders to believe or application. Select multiple photos visually sliding and marking them. Share the picture via AirDrop, a new feature available in iPhone 5 or later, iPad (4. Third generation ), iPad mini and iPod touch 5G, allowing us to share files with nearby devices with activated function, using wireless and bluetooth. Send it by message or email or share on Twitter, Facebook or Flickr. How do I delete one or more photos? If it's just a photo simply open the photo and click the Trash button. If we delete several, in the view of all the photos click " Select " at the top right and began to set we want to delete. Once the selection click on the trash. Once the issue do not forget to press the "Save" button. You can quickly copy a photo to paste into another application holding the picture in any of the views in the application and clicking "Copy ". How do I change a capture mode to another? Simply sliding your finger across the screen from right to left or vice versa. I can? Use filters in real time to take a picture? Only with the normal photo mode and 1:1. We select any of these modes and press the filter button at the bottom right. Remember that you can also apply them to any photo from the Photos application. How do I enable Flash / HDR mode? Touching the corresponding text in the top of the screen, and can activate or deactivate the HDR or activate, deactivate or leave Auto Flash. If we pressed the button to take pictures the camera takes pictures quickly on something like a " burst mode ". We can use the volume buttons to take pictures. What is the VIP box? It is a box that allows us to have multiple contacts listed in a single mailbox. Ideal for people you want to have checked their emails. Also, the sound will sound when receiving an email will be different from the rest, being able to know if you send us an email only to hear it. How do I add contacts to the VIP box? We just have to click on the " i " next to the box and click on " Add VIP" ( to keep in mind that we must have saved your mail on the contact tab ). From there we can also remove them. I can? Change the order or add new mailboxes? Yes, one of the new features of iOS 7 is that we can manage our mailboxes more effectively. You only need to access mail and click on " Edit" on the page listing all mailboxes. From there we can move, hide / unhide, add shortcuts to folders within the mailbox or multiple mailboxes even add special one to see all the unread or containing attachments. I deleted an email accidentally. I can? Back? Your mail should be in the trash for the mailbox, but you can recover quickly. We simply have to shake the device to leave us an option to " Undo Delete ". I can create signatures? For my accounts? Yes, you can do this from Settings / Mail, Contacts, Calend. / Signature. From there you can create one for all your accounts or more individually. Can I save attachments on the device? IOS by default do not have anywhere to store documents to photos, videos or texts, but using third party applications like Dropbox, LogMeIn or similar, we can charge the device in the app you want, for it simply will access the document and press the button to share ( square with arrow). How do I search from the Safari app? In version 7, iOS, have unified the two bars before present: the url entry and search, so from the bar that we will enter a web both directly and perform a search. The main difference is that a domain will end and the other not. How do I add favorite sites to the page that appears to put us on the text input bar? First we need to load the web page you want to add to favorites. Then click on the button to " Share " ( small square with arrow up) and will press the " Favorite". Once done select the name for the web and modify the location, making sure it is in " Preferred ". Now store and ready. Is there a limit of tabs open as iOS 6? To our knowledge there is not, but we've gone crazy not opening tabs... What I know for sure is that more than 20 may be opened without problems. How do I close an open tab? Just let's access the tab by the lower right button ( two squares together) and locate the tab you want to close. Now we just have to " throw " to the left to close. Safari has some sort? Private browsing? Yes, we need to activate it to access tabs screen through the lower right button ( two squares together), and click on " Nav. Private ". To turn it off we have to follow the same process. To navigate forward or backward on pages that we can visit swiping from the left or right to do so quickly.